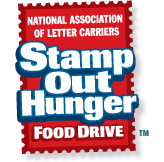 Don’t miss the Stamp Out Hunger Food Drive on Saturday, May 14 where you can donate a bag of non-perishable food by leaving it at your mailbox. It’s an easy way to make a food donation, and I’m guessing some of you may have a very well-stocked pantry and could spare some of your extras! I’m calling this a “freebie event” because you don’t have to drive anywhere to make your donation. And it’s just important to remember that the food banks need donations all year round.